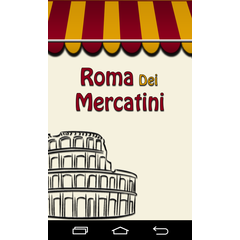 ROMA DEI MERCATINI E' LA NUOVA APP CHE TI SEGNALA LA PRESENZA DEI MIGLIORI BANCHISTI NEI MERCATI DELLA CAPITALE. L’APPLICAZIONE, COMPLETAMENTE GRATUITA, È COMPATIBILE CON DISPOSITIVI APPLE E ANDROID. L’APP ATTRAVERSO L’INVIO DI ALERT GIORNALIERI TI GUIDERA’ ALLA RICERCA DELLE MIGLIORI OCCASIONI E ARTICOLI ESCLUSIVI, OTTIMIZZANDO IL TEMPO DEI TUOI ACQUISTI. ROMA DEI MERCATINI E’ ANCHE SU FACEBOOK. ISCRIVITI ALLA NOSTRA PAGINA UFFICIALE E TIENITI AL PASSO CON NEWS ED EVENTI. POTRAI SFOGLIARE LA NOSTRA GALLERIA FOTOGRAFICA E VIAGGIARE VIRTUALMENTE TRA I MIGLIORI BANCHI CAPITOLINI. KEEP CALM AND… ROMA DEI MERCATINI!